Do you see your child being obsessed with the Jurassic time period and stories of the dinosaurs? Well, in that case, you could treat your kid with a lovely prehistoric room. Start with painting the walls for decorating kid’s rooms. When it comes to the pre-historic theme you have lots of options to choose from. If you are a good artist, or if you are hiring a professional, you can print designs like that of humans warming their hands. If the realistic touch could be given to the paintings, painting a shadow on one the walls is also a great idea. However, it is extremely crucial that you do the paintings neatly, selecting the location and the color well, so as to get the right effect. To make the room look more like a cave, get the walls painted in sand texture, in the color of beige, and use lighting at appropriate places. Painting a cave opening is a fantastic idea. You can also draw volcanoes, torches, palm trees etc, to make it look like something right out of the jungle book. However, in case you are not too artistic, you can stick to wall stickers, and put them creatively to create the same lively effect. Just let your imagination run wild and see what all you can have done to make your kid’s room look like the world of his fantasy dreams! The floor of the kid’s room decorations must be simple. Get commercial carpets in tight weaves in beige colors for the room theme. 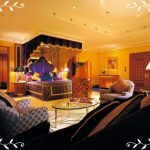 Animal pelt or fake animal rug style floor coverings are good too. Throw rugs with dinosaur prints are other fun options. For kid’s room decoration in the Jurassic theme, you have lots of options of window treatment and bedding. For kids room décor buy friendly looking prints of animals in cartoon styles. For kids that are older you can get stuff that look are ferocious. Designs in fossils and bones print and style are also good options. Many a times these beddings come with matching curtains. For window toppers, get some animal pelts to attach on a board form. The children’s bedroom furniture for a Stone Age room could look like something right out of the Flintstones cartoon series. Get the old furniture remade in a stylish way to create the look. Use imagination, and paint them with the right texture, to get the exact look. You might even like to add a bit of polyurethane to make them durable enough for the baby room decorations. Use stone garden benches for seating, softening them with artificial animal pelts. 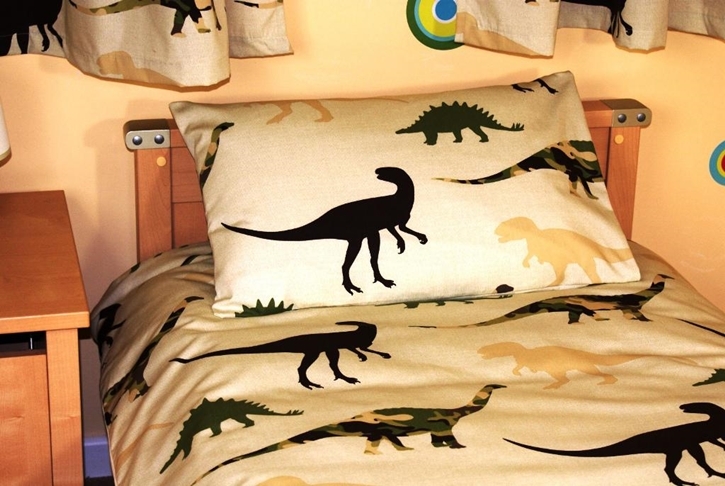 For kids bedrooms accessories here, the best and the most obvious choice would be dinosaurs. You can get them the right stuffed animals, lamps knick knacks, photographs, bookends, etc. You may even try spray painting the regular accessories giving them the right look for the new theme that you have selected. Imprint them with new designs in appropriate colors. Large dinosaur replicas are great options for baby room décor.